I never learned to swim. Two summers of lessons at the YMCA and a round of private adult lessons and I still can do little more than float on my back for ten seconds. I have a friend who can’t swim either – Nana Malone. She’s a fabulous author of spicy, contemporary romance, and we’ve been talking about writing a book together for years. I had an idea for a contemporary wedding series last fall and bugged her until she said yes to co-writing it with me, because let’s face it, I know nothing about writing contemporary romance. We made loose plans to start the book in February. I had no real idea about the plot, but knew it would be great fun to write a story with her. Then I read an article in Elle magazine about an adult woman who couldn’t swim and decided to take swim lessons. She was so terrified of the water, she was demoted to a special class beneath the beginners, but there she encountered an exceptional teacher who helped her overcome her fears. Her story was amazing, and she learned a lot about herself and life in the process of learning to swim. Inspiration struck. Just like the author in the Elle story, I feared diving into certain areas of my life. The shallow end of the pool was comfortable because I could always put my feet down. Taking risks in life can be scary. In my career I’ve taken plenty, but in my personal life, not so much. A few here and there…some worked out, others didn’t. Being a responsible adult with kids, a husband, pets, life insurance, and a bank account is a good thing. But sometimes, you need to break out of the rut and dip your toe into deep waters. I sent a copy of the swimming article to Nana. At that time, I had no idea she’d never learned to swim either, so we had a good laugh about the irony. We wondered how many readers could relate, if only metaphorically, with a heroine who was afraid to dive deep into life? From that discussion, Becca was born, and so was our hero, Liam, her awesome swim instructor. The real challenge for me was writing Liam. In our story, he’s a fantastic swimmer, and was at one time on his way to the Olympics. Since I can’t swim myself and it’s been a while since lessons, I had to do my research. But getting into the mind of a swimmer, much like any athlete, is amazing. They have strength and stamina beyond reason. Their world in the water, and their take on life, is inspiring. I hope I conveyed at least some of that in Liam. 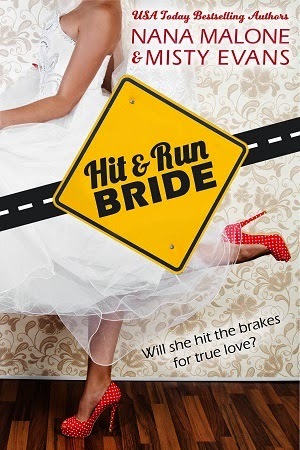 Hit & Run Bride officially released June 1st and has already hit a couple of bestseller lists at Amazon. It’s also garnering some nice reviews. I hope all my readers enjoy the story – it has some real comedic moments in it, and of course, an HEA – but I also hope readers take away a message about life…that taking risks can bring you true love and going deep can be the ultimate reward. So tell me, readers, do you love the water or fear it? Leave a comment and be entered to win a $10 iTunes gift card from me. **The first book in a New Adult contemporary romance series from USA TODAY bestselling authors Nana Malone and Misty Evans! **This contemporary New Adult romance is intended for readers 17+. Contains adult content, language, and situations. Marketing analyst Becca Daniels has a life that looks good on paper. A coveted promotion in an exciting new city and a successful, handsome fiancé. But with her Hawaiian honeymoon fast approaching, she has to face her biggest fear…water. She can’t swim. On her way to her first swimming lesson, however, she veers left instead of right and nearly runs over her hot, new swim instructor. Liam Caldwell has put his life on hold to look after his sick mother. The last thing he needs is the hit-and-run brunette who ruined his motorcycle disrupting the adult swim class. But from the first lesson, he realizes there’s more to the curvy, smart-mouthed Becca than meets the eye, and no matter what he does, he can’t resist her luscious lips and her driving determination. With each lesson, Becca discovers that what looks good on paper isn’t making her happy. Should she play it safe in the shallow end with her career and fiancé? Or should she dive into deep waters with a man who offers passion and freedom like she’s never imagined? Misty likes her coffee black, her conspiracy stories juicy, and her wicked characters dressed in couture. When not reading or writing, she enjoys music, movies, and hanging out with her husband, twin sons, and two spoiled dogs. 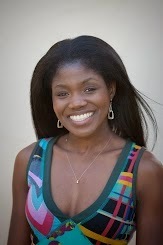 Learn more and sign up for her newsletter at www.readmistyevans.com. Like her author page on Facebook or follow her on Twitter.